An der obersten Größengrenze stehend, mittelkräftig, gehaltvoll, kräftiger Kopf, sehr schöner Ausdruck, harmonisch, genügend fest. Korrekte Front, ausgeprägter Widerrist, etwas kurze und etwas abfallende Kruppe, richtige Lage des Schulterblattes, etwas steiler Oberarm, gut gewinkelte Hinterhand, freies Gangwerk mit kraftvollem Nachschub. TSB ausgeprägt; läßt ab. Dax de Intercanina, BSZS - 08.
sad news to know that dax is gone! great dog ! R.I.P. dax !! I LOVE THIS BOY VERY MUCH. I think that you will find that it was DAX who was sold to China. Awesome dog, outstanding ZAMP son, well promising producer! Both the brothers DAX & DUX are rocking. Uptill now who has been able to produce better puppies ? Comments from people who actually saw the puppies from both these dogs will prove very guiding? Already goodlooking progeny from Dax, looks promising for the future breeding. Dux and Dax; two stunning brothers, with a superb pedigree. Just commented on his brother, these are males of a very high quality. Love them both and hope to use one or the other for my Erasmus daughter. Him and his brother Dux just blows me away - absolutely hot stuff. Love them both, and look forward to seing them this summer in Ulm. 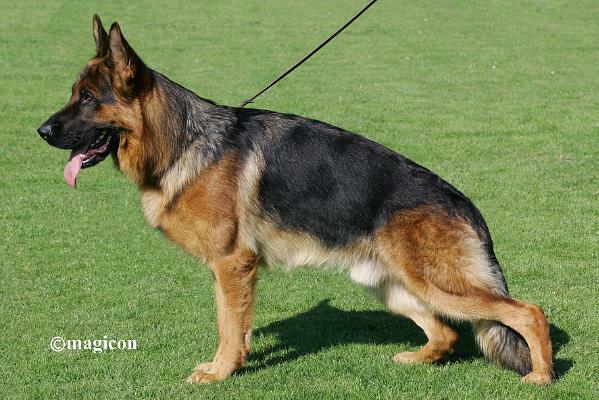 Just entering the pedigree database my interest mostly is Zamp Thermodos progeny, I am a new member here, but has been breeding german sheperds for more than 30 years. Dax caught my eye at Siegerschau 2008, and is a male that I have great expectations to in regard to future breeding. Him and his brother Dux will do extremely well at upcoming Siegerschau's and they have the blodlines to produce "over the top" progeny. If photos are anything to go by this is my favorite Zamp son ,what a super looking dog, best of luck to his lucky owners! I am a BIG BIG fan of both Dax and Dux. 2 absolutely beaustiful males with stunning heads. Does anyone have have the contact info for the owners? I know Hans-Joachim Dux owns Dux, but I dont have his contact info. I cant seem to find it on the web. Also I do not know who owns Dax. Is he also in germany? Does anyone have his owners website and / or contact info? nice and strong looking dog,which country this dog is located from? A really top quality young male! Same as his brother Dux! !